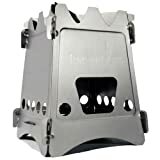 Looking for the best camp stove reviews for your camping prep shopping list? Well, look no further. 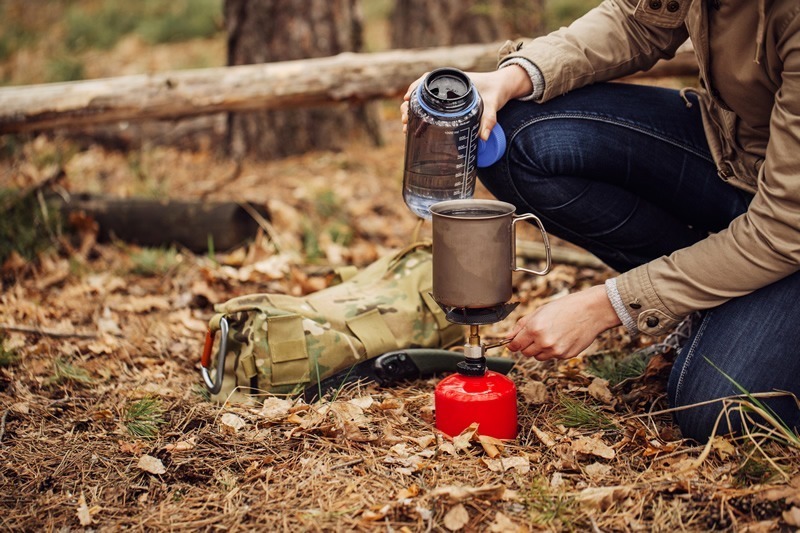 Here we go over the 5 top camping stoves on the market today. All of them are reliable, portable, and rugged enough to withstand your usual excursions—and they won’t fail you on one cold night when all you want to do is cook up some warm soup. 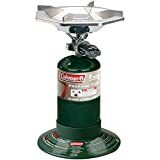 Equipped with a 10,000 BTU burner, this is one portable stove that many a camper will be glad to have due to its steady flame and fuel stream. The burner can be adjusted and fits an 8in pan easily. The stove runs on the 16.4oz Coleman propane bottle and both the burner and base can be separated from the fuel bottle. It also has wind baffles for cooking in windy areas. The only bad thing about this (if you can call it that) is that you still need a flint or a matchstick to light it since it doesn’t have its own ignitor. Other than that the Coleman Bottle Top Stove is an amazing little gadget for under $20. It has good durability, isn’t likely to topple over, and manages to hold a flame even under strong winds. It’s also fairly light at under 4lbs (without the fuel canister, of course). This unique, double-walled cylinder stove uses natural convection to produce a clean and sustained burn using only twigs and other wood pieces. It is made of stainless steel and nichrome wire. It also has an ash pan and a heat shield below to protect the ground under the stove. 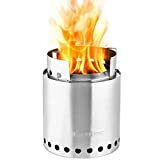 The Solo Stove Campfire is an absolutely amazing wood-burning stove for just a little over $100. What makes it so amazing is that it uses two stages of combustion to yield a near-smokeless wood fire with amazing and easily sustained heat. It does require you to start it with a spark, but that’s a given with wood-burning stoves. A bigger complaint is probably that it only has 3 support prongs for your pans at the top. Still, it’s not like it’s that hard to use the 3-prong design as it is. Even the fact that you can’t turn a knob and precisely adjust the heat on it the way you do with gas/electric stoves is fine once you see how to deal with it (adjust fuel feeding and starting amounts). It does take a bit of space due to its shape, but it’s very light and would be great for big family camping trips. The UL stands for ultra-light, and this stove lives up to that name by weighing less than 5.45oz. It gets its strength and lightness from a titanium build. It is made in the USA, can be folded and packed flat, and has a lifetime warranty. This is a fantastic stove for about $70, especially if you consider that it’s made out of titanium. It’s very sturdy, very light, and can be packed away into such a small package that many a backpacker will love it on first sight. Zero hinges means less to worry about in the long run (hinges break over time). The Emberlit Titaniumis easy to clean due to a special coating that resists carbon buildup, and it’s also a wood burner so you don’t have to pack a heavy fuel can. It does need a bit of help in windy environments, but a makeshift windbreak will do the job without a fuss. 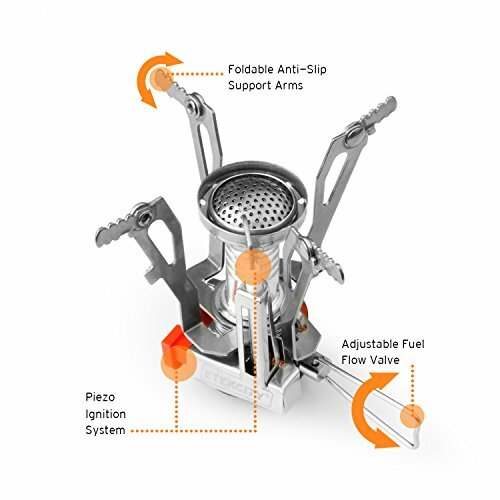 The Bushbox Pocket Stove is a modular multi-fuel stove that can be used with wood or a Trangia or Esbit burner. It is made of stainless steel, has an ash pan, and can be taken apart and folded up flat. This fantastic little wood burner/burner wind protector is available for about $35, which is reasonable if you consider how well made it is. 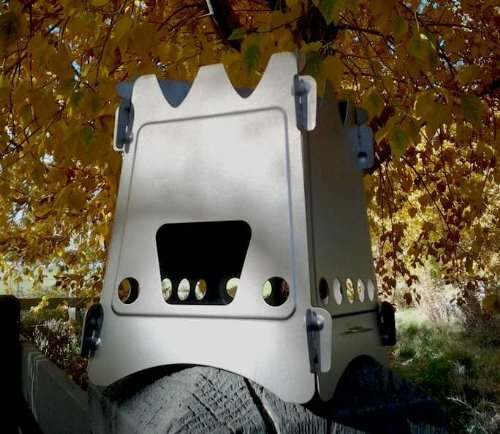 The Bushbox is easy to put together, can be hidden away quickly, and is simple to use as well. 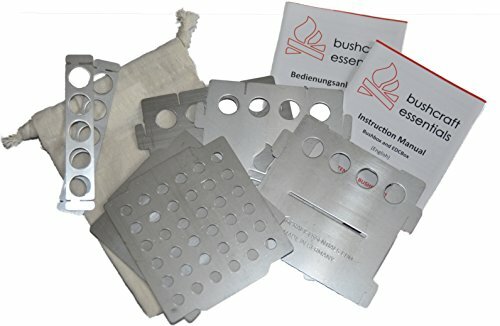 It’s actually a great introduction to the modular wood burners, so even if you’ve never used these before, you should have a blast using this one. 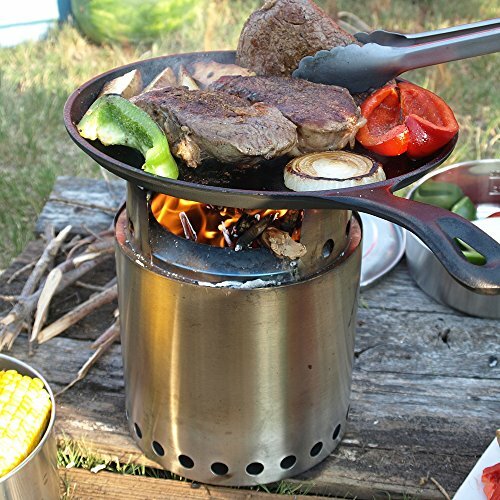 Made of an aluminum alloy and stainless steel, this lightweight stove is still durable enough to take the heat. It will take any butane/butane-propane canister with a thread 7/16 NS Lindal Valve. It is compact and comes with a carrying case. It can hold pots up to 7in in diameter. This is a great little burner to carry around. It comes in a protective case, packs away in a compact and light bundle, and can easily be used by just about anyone. It does suffer from high winds because it sits so high when on a fuel can, but you could just make a tall windbreak for that. It could also use a tougher metal construction since there’s a very slight bit of bend to some parts if you exert force on them. That said the Etekcity Ultralight is available for under a mere $10. At that price, you can probably stand any little issue it carries with it given its overall usability. 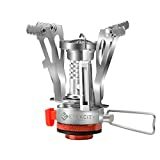 So which is the Best Camp Stove for your camp trip? The Coleman and Emberlit are the best buys here. They’re easy to pack away, don’t make you feel like you’ve stuffed a kid in your backpack, and get up some nice heat very easily. Given how easily packable they are, you could even bring both along on the same trip just for safety. Use the Coleman when there’s no dry wood around, for instance, and use the Emberlit when there’s some handy. The runner up, the Etekcity model, gets its position from its affordability and general utility, although it fails to overtake the other two due to relative weaknesses in its build.